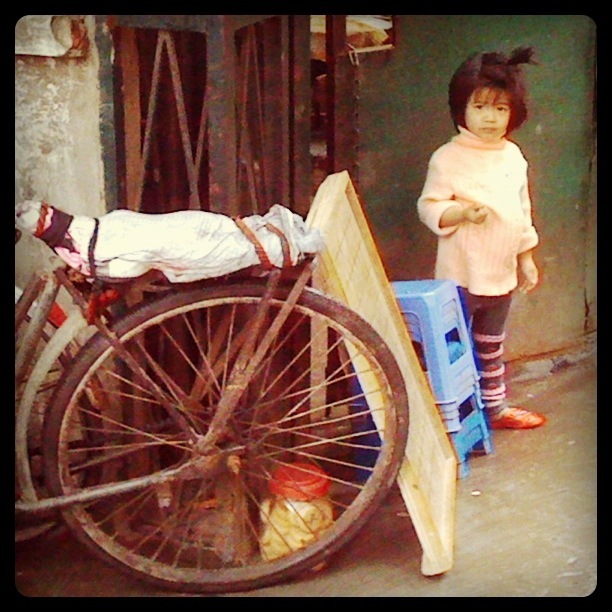 This week I read a blog post called “The Ugly Side of Parenting in China” penned by a fellow female expat blogger in China. I started penning this post below as a response to her blog posting. However, I realized I had a lot to say about this topic so I have turned this into a blog posting of my own below. A few weeks ago, I witnessed a wailing, crying boy about three years old at the side of the road with no guardian to speak of with him. I wanted to go to the boy’s side and comfort him but thought perhaps that the sight of strange, tall foreign women during his moment of trauma would only make it worse for him so I carefully stood near him a couple of meters away just to make sure he wouldn’t be completely alone. Various people walked by or stood on the sidelines watching, unsure how to handle the situation. I noticed across the busy road a woman with an angry look on her face staring down the boy. I guessed she was his mother. Busses and cars whizzed by separating them. I felt helpless and confused. Eventually, another older woman came up to the boy with a child’s bike in hand nonchalantly trying to calm him. I myself was shocked and horrified that someone could just abandon their child at the side of the road like that. My two Western male friends were also surprised, one of them wondering aloud why no other people came up to help the boy or at least ask who or where his mother was. In sharing this story with friends a few nights later, my other Western friends were not impressed. However, my Chinese friend piped in and commented that her mother had meted out the same punishment to her when she was a child. My friend explained that it was probably necessary because the boy had probably been naughty. The mother may have had to make a point and wasn’t going to back down. It was interesting to get the different perspective of the situation from a Chinese friend compared to my other foreign friends. I wish I could have gotten the take on it from more Chinese people. Based on the lack of involvement of other people on the scene, it also made me question whether it is frequently the Chinese stance to not get involved in other people’s affairs. For the most part, I can’t say I have seen a lot of other examples of what I would call “bad parenting” here in China. Usually, I am more in awe of how committed and dedicated parents and grandparents are to their children. I have seen so many displays of very loving tenderness. On the flip side, perhaps many children are indeed spoiled here, especially those of the one-child generation. But at the same time, many Chinese children may often have to live the life their parents mapped out for them without the opportunity to discover their own interests, friends, and how to recover from mistakes. I understand that many parents are also very critical of their children while also having the contradictory attitude that their children can do no wrong. At the end of the day, bad parenting happens everywhere in the world. It’s hard for me to completely judge what “bad parenting” is as I have never been a parent myself or walked in a parent’s shoes. Some parents will do things that seem horrific to others but perhaps the parent him or herself has no choice. I had to bite my tongue this summer when a friend in the US angrily commented on the “bad parenting” of some young parents we witnessed taking their little boy out for Burger King at 2 am in the morning. I wanted to comment, “Don’t judge.” Perhaps the parents had to both work late and the only chance they had for a semblance of family-time was at that hour where they could get a quick and inexpensive bite to eat. A few years back, I felt awful for having to call Child Protective Services on a woman I learned had left her two year old child alone in a dark car on a freezing, December night while she took an exam at the local community college where I was working that night. Awful because this woman was only trying to improve her life and therefore her child’s life by taking the course and the exam and she couldn’t find anyone else to care for her child that night. Reflecting on this situation, if I had known, I could have told her that she could have brought her child into the classroom. Perhaps I could have pushed a letter to the college inquiring about daycare and babysitting services during classes for struggling, single parents like her. These very circumstances make me question whether others should indeed intervene and interfere or stand by on the sidelines and watch while judging. In addition to witnessing what some might call questionable parenting, I have been fortunate to observe amazing parenting as well. I like to think my own parents raised me well. I have also watched many friends and family members become parents in the last few years. Like other things I “catalog” into my brain, I have unconsciously catalogued moving moments I have witnessed between parent friends and their little ones, perhaps because I hope to try my own hand at parenting someday. A couple of years ago here in Nanjing, I felt privileged to quietly sit in the backseat of the car with my friend and his wife as they sang a song to their little girl who beamed up at her parents during the serenade. I also catalogued how another friend seemed like a natural, applying sternness while also infusing compassion and love in his voice while handling a situation with his young son. Additionally, not so much in China but definitely in the US, I have also witnessed some wonderful parenting and role-modeling by non-parents. A teacher, family support worker, guidance counselor, foster parent, principal, or YMCA coordinator- all of these people have in some ways helped build communities for some children, imparting important values, and sometimes being the only people to listen and provide guidance to a child during her or his time of need. In the end, I will probably remain conflicted as to what is good and bad parenting and what is acceptable and unacceptable both outside of China and in China. I can’t entirely put my finger on whether most Chinese people prefer to not interfere or intervene in other people’s affairs, especially parenting, or if that stance is prevalent in cultures worldwide. I do believe it is sometimes difficult to distinguish between judging and interfering, helping others and doing what is right. I also can’t decide if I prefer the notion of a family-centered support system like what is so prevalent here in China or the notion of an entire community reaching out to support and help others like what I witnessed at times in the US. I am grateful that I have had the chance to witness all of these takes on the different walks of life while here in China and that this has also helped me reflect on aspects of living as I know from the US and other corners of the world. I guess it’s also okay that I don’t have a clear and definitive stance on any of these aspects of living, parenting, growing up, love, romance, growing old, or community. I’ll keep questioning and discovering and I’m okay with that.